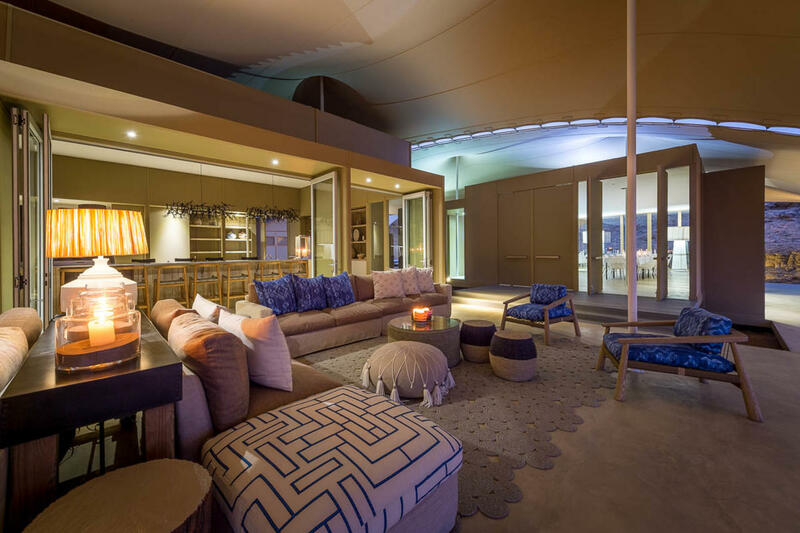 Similar to Chief’s and Vumbura Camp in Botswana during the year-end and summer seasons, availability at the luxury seven-suite Hoanib Camp on the Skeleton Coast of Namibia is limited and must be requested at least one year in advance. Set in a private concession area, the stark desert landscape here is an otherworldly contrast from the Okavango Delta of Botswana. It is truly a wonderful experience to see elephants, lions, giraffe, and hyena roaming the dunes of this arid environment. Another big plus is its four-hour drive distance from Namibia’s shoreline, dotted with Cape fur seal colonies! Based on the area’s limited rainfall, Hoanib Camp is a year-round destination, although the local guides feel March to May offers the most idyllic conditions for lush wildlife-viewing. With no Wi-Fi here, this is a place where you will be temporarily off the grid! Situated in the isolated land of Koakoveld, Hoanib Skeleton Coast Camp is quietly tucked among the most unique environment of bare mountains, gravel-strewn plains, and dry river beds that play host to an assortment of desert-adapted animals seen nowhere else on the planet. An almost forgotten land, here you will enter a place few have the privilege to experience and may wonder at some point if you have stepped into another realm. While many African countries claim plentiful wildlife with stunning backdrops, few can compare to Namibia’s distinct and untamed landscape. Cay Christos, our safari wildlife adviser, attests that Hoanib Skeleton Camp is the perfect location and camp for a Namibian coastal immersion. Explorations of this far-off land include wildlife drives along the riverbeds where hardy desert animals collect including elephants, giraffes, gemsbok, springbok, lion, and brown hyena. You have the opportunity to speak with researchers situated on the camp as well and hear the latest findings regarding lion behavior in Namibia. With the Skeleton Coast having almost inhabitable conditions for humans, you may take a scenic drive or helicopter flight to the coast depending on the weather. Clients are particularly stunned by the hoard of loud sea lions juxtaposed to the eerie and abundant shipwrecks overtaken by the desert coast.